The pioneer era of gardening in Canada began in the 1800s with Samuel de Champlain in Quebec and with the Hudson’s Bay Company posts up north. Throughout Canada’s history tenacious pioneers have struggled with a land that was sometimes fertile but more often rocky or densely forested. In order to survive, however, pioneers had no choice but to persevere to raise crops. Immigrants to Upper Canada from England, Scotland, Ireland and the United States brought with them their knowledge as well as seeds, plants and trees. Once settled, they often sent home for seeds and books, and then experimented with adapting them to the Canadian climate. Daily pioneer life in this region is illustrated in the books and letters of sisters, Catharine Parr Traill and Susanna Moodie. In “The Backwoods of Canada”, Traill describes her early years in the Peterborough area in the 1830s when she and her husband had to clear the land, fence it, build a house, dig a well and construct a root cellar. Their garden contained peas, beans, lettuce, cabbage and root crops. Life would have been similar for Stanhope pioneers. In the 1855 “Canadian Settler’s Guide” Traill recommended planting potatoes, Indian corn and turnips the first year, and encouraged gardeners to save seeds. ”If you have more than a sufficiency for yourself do not begrudge a friend a share of your superfluous garden seeds. In a new country like Canada a kind and liberal spirit should be encouraged,” she wrote. Every pioneer family had a garden in which potatoes and turnips, pumpkins, peas and melons were planted and, in keeping with Traill’s advice, sharing was commonplace. By the early 19th century settlers had their vegetable gardens in check and more and more decorative gardens were appearing. 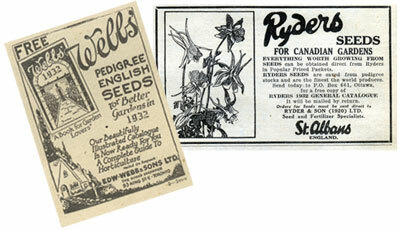 A variety of Ontario publications were produced including helpful guides about gardening in the Canadian environment. Seed companies had become well established and their catalogues contained beautifully detailed illustrations of flowers, vegetables and fruits. The concept of Heritage Gardening has acquired renewed interest over the last decade. Books, websites, listserves and magazines and newspaper columns provide advice and instruction on developing and maintaining gardens populated with historically appropriate plants. In keeping with this trend, the Stanhope Heritage Garden will continue to expand in honour of our forefathers and their well-documented dedication to life on the land.